Have you ever wondered why your cellphone sometimes overheats for no apparent reason? Well it turns out, as Keith & Laura Nicole Harrison’s ambitious new musical suggests, the emojis behind your touch screen are having a hot time by themselves. Bringing new meaning to the phrase “smart device,” Emojiland is set within the confines of an iPhone where there’s enough friction, warm friendship, heated passion and general blasts of energy transpiring among it’s digitized citizens to burn a hole in your pocket. Like attention-challenged teens who forever switch from one app to the next, the authors explore no fewer than five subplots involving over a dozen characters, while the fine score ricochets from rap to soul to power ballads to love duets. All this sound and flurry is put to a greater purpose as we come to realize there is a certain god in the machine, and a devil as well, and a spiritual message that suggests while we all must liveth for the upgrade, we must feareth not the factory reset. It’s the circuit of life. 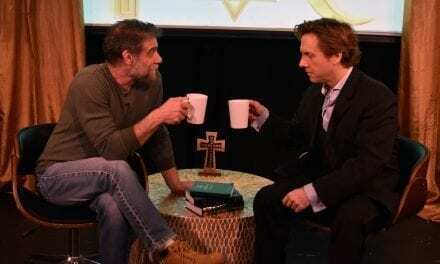 In this New York Musical Festival production, the writers are also the romantic leads. Ms. Harrison is totally enchanting playing 🙂 , a.k.a. Smize, a happy face hiding a troubled soul. In a lovely Act 1 ballad she laments,“It isn’t easy being Smiling Face With Smiling Eyes, when all I want to do is cry.” while, for good measure, expressing her woe with a few impressive beats of modern dance. Mr. Harrison, meanwhile, winningly plays Nerd Face, the new emoji in town, who steals Smize’s heart even as he unwittingly causes a serious malfunction across the land. With a romantic chemistry that suggests they are a Little Shop of Horrors revival just waiting to happen, Smize digs deep into her soul and the nerd becomes the hero she has always needed. Then there are the troublemakers. 😎 , a.k.a. Sunny (Cooper Howell) is Smize’s erstwhile boyfriend, carrying on an affair with the can’t-say-no Kissy Face (Chloe Fox). He is such a jerk that Mr. Howell can find no warmth in his programming. And there is Skull (Jordon Bolden), the show’s personification of existential dread. He gets two killer rock ballads that he performs hauntingly. But, while it is pretty brilliant to have a skull steal Hamlet’s immortal line, “To be or not to be,” Mr. Bolden fails to unearth the proper Shakespearean depth of the role while shrouded in a post-apocalypse hoodie and hindered by an over application of makeup. Also problematic is the computer virus he inflicts on his fellow cyber-denizens. “Virus” is a very loaded term to be throwing around a musical comedy and, when a dying Sunny informs us that he “got the virus from Prince,” the heft of the implication generates an uneasy laugh and causes us to recalibrate the weight of the show. Emojis are a great way of indicating the intended mood of a text message. But when they are brought to life and forced to deal with big issues, the emotional intent can sometimes get lost in the translation. 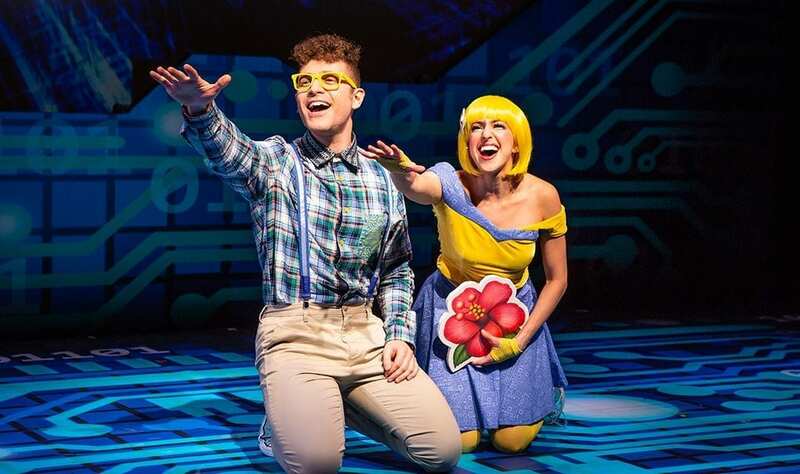 Emojiland: A Textistential Musical – Book, Music and Lyrics by Keith Harrison & Laura Nicole Harrison; Directed by Thomas Caruso. 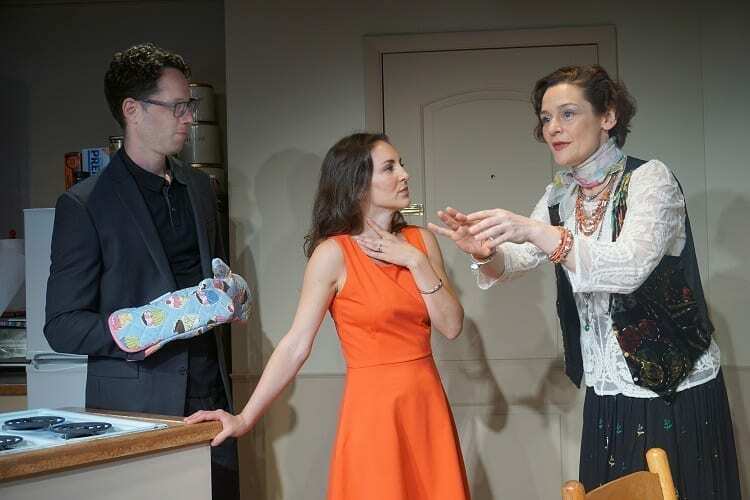 Kenny Ingram, Choreographer; David Goldstein, Scenic Designer; Jamie Roderick, Lighting Designer; Sarah Zinn, Costume Designer; Ken Goodwin, Sound Designer; Lisa Renkel, Projection Designer; Heather Klein, Production Stage Manager. 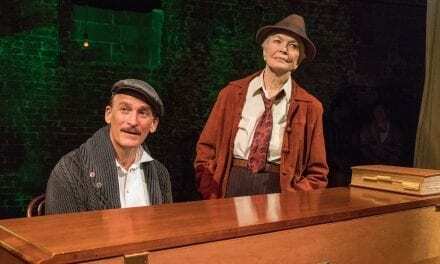 NYMF at The Acorn Theatre at Theatre Row, 410 W 42nd St, https://web.ovationtix.com/trs/pe.c/10291488. Through Sunday, July 22. Running Time: 2 hours.